OMG Posters! » Archive "PSiLOVEU #4" Art Print by Jason Thielke - OMG Posters! Limited Addiction Gallery is continuing their constant mission to feature artwork by awesome underrated artists, this time it’s Jason Thielke. His artwork is featured in their newest show, and they have also published a print edition, PSiLOVEU #4. 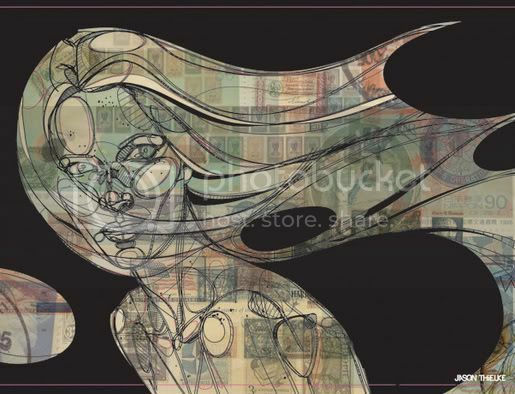 This is an 18″ x 24″ giclee, has an edition of only 25, and is $80. Visit LimitedAddictionGallery.com. To see the rest of the show, click here. Looks like the prints are all gone now. Very nice though. 5 for sale at the show tomorrow, see you ther! Thielke is seriously underrated – hopefully this show will give his art some of the respect it rightfully deserves. I have never heard of this guy until now and this is some of the freshest shite I’ve seen in a while. I’m pissed I missed out on the print.